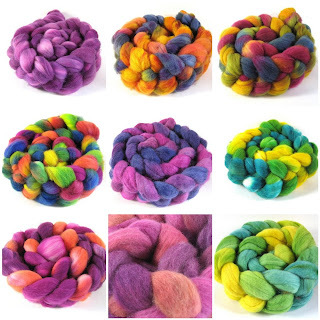 I've been saving up for a drum carder, and I've just ordered it! I purchased a Fancy Kitty brand Kitten drum carder, and I think it should be here within a week! Why do I need one? Right now I have to rely on the generosity of friends with drum carders (hi Celeste!) or the openness of the MN Weavers Guild, and I have far more fiber and ideas than I can process with the existing availability of those carders. Here are some of my recent batts using other people's carders. 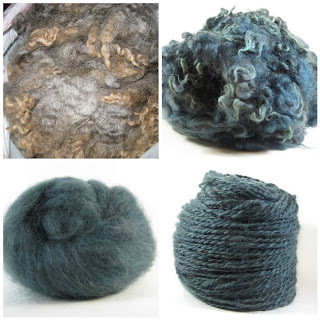 First, a few photos to show the stages of how a batch of wool becomes a batt or yarn. I call this first set Teal Steel - dark gray Romney wool was dyed with blue and greens, then carded with a little bit of carbonized (dark gray) bamboo. 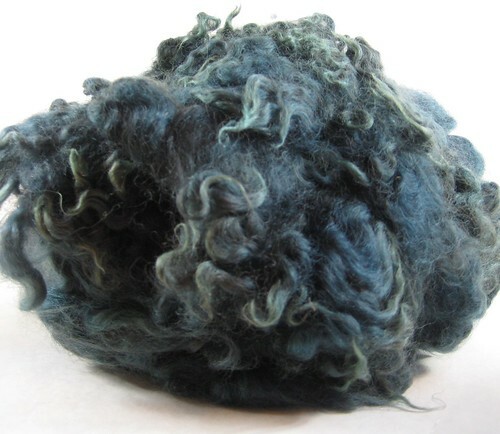 Once the wool is dyed, it's picked apart - think of it getting the snarls out of hair before the fancy hairdo. The second photo in each of the next two rows shows wool that's been opened up and is ready for the carder. 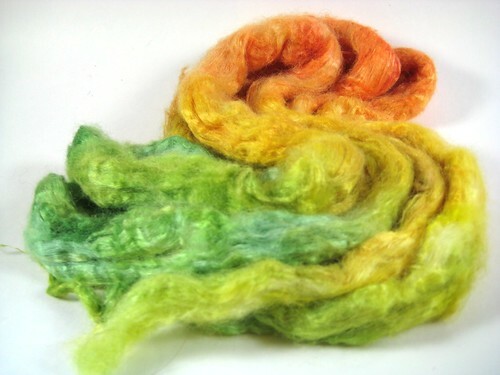 Then the fiber is fed into the carder and blended as much as you want. In the Teal Steel above, I did nothing to keep the colors distinct, so the batts and yarn don't have distinct differences in the range of colors. In the first row, I started with three colors, but wanted only two colorways in the final batts. I picked each color apart separately, then divided the multi-colored one (in the middle of the second picture) between the light and the dark, and then carded. 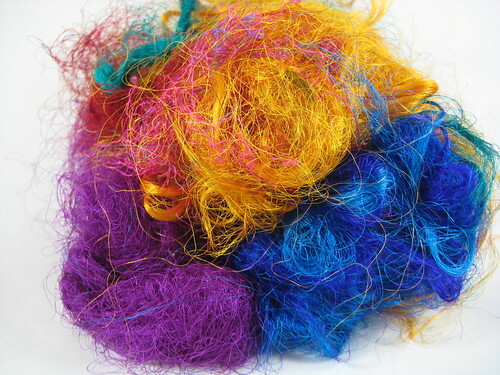 There are two lighter batts and two darker batts, each with that multi-colored fiber well blended in. You can see there's more depth in the batts than there is in the plain greens in the first picture. In the second, which I call Rainbow Sherbet, I wanted the colors not to be blended, so that the orange, yellow, and green would stay distinct. 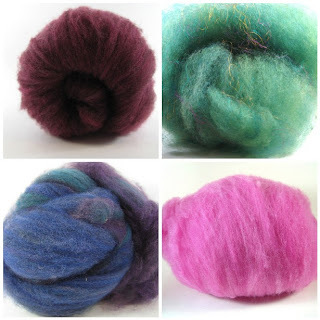 Again, I picked apart the wool into batches based on color. I then carded each color individually, and at the end, took 1/3 of each color and layered them, with as little color-blending as possible. Each batt has the same ratio of colors - orange, yellow, and green. One is rolled inside out to show the color of the other side. Sure, you say, but this is the Spinning Daisy, not the Carding Daisy... Where's the yarn? Well, in addition to the Teal Steel in the first mosaic, I've been learning to spin art yarn, specifically coiled yarn. Also some non-coiled yarn in the last row. Most of this will be up on Etsy soon - I just have to dedicate some time to list them. And yes, I do love the Mosaic Maker, which creates photo mosaics. Why do you ask? I've been away from 99% of my fiber and had gone into withdrawal, but I'm back. Mr. Daisy and I roadtripped with his (Mr. Daisy's) parents to Denver to visit our newish nephew (8 months old), as well as his (nephew's) parents. We drove through two days of blizzard/white-out conditions in Minnesota, Iowa, and Nebraska to get there. He's very tactile - likes different textures, and really likes grabbing straps and cords, so I thought perhaps spinning would be a good fit for him. 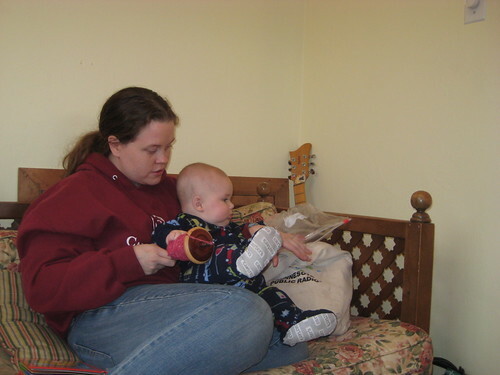 I tried to teach him about spinning, but he seemed more interested in the spindle as something to chew on than to spin. He likes to eat (or at least chew) lots of things - none of which are food. 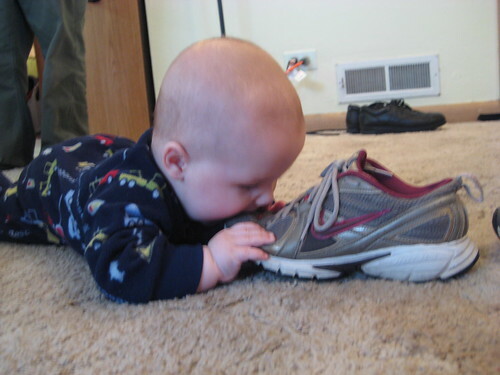 Apparently electrical cords are also a favorite chew toy, but his parents have kept those out of his reach, so no pictures. Now I'm back and in spinning mode. I spun for a few hours yesterday and today at home, then went to a spinning group for 5 hours today, will spin another 4 on Sunday with a different group. No pictures of new yarn yet, but I do have new fiber. 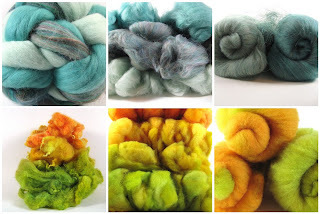 Before I left, I had a dyeing day where I dyed 3 batches of fiber. One was an attempt to get a combination of orange, yellow, and green. I did this on wool fleece as well as on silk, with no set plans about how I would combine the two. I now have some plans, but I want to see how the wool looks carded up. The silk looks exactly how I wanted it to look, which is pretty exciting. The wool is close, but I wish I'd gotten more plain yellow. Continuing with the three-color attempts but wanting something more monotonal, I did two batches of two greens and a blue. The first picture is what I originally dyed; since I generally put in too much dye, I threw in some fleece afterwards to soak up the rest of the dye. 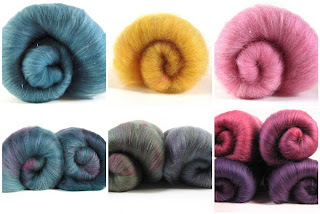 The fleece turned out to be more of a blended color, rather than the distinct colors you see in the first batch. And then, when I was in Denver, I supported the local economy as well as independent businesses by patronizing a great multi-craft shop, the Fancy Tiger. 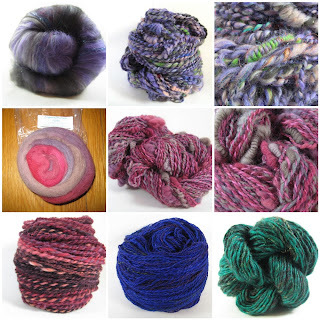 I bought lots of fiber and at good prices - alpaca, BFL, "faux cashmere," silk, and a few other small things, all for me, and a little bit of fiber for other people. All for the good of the economy, of course. No selfish motives at all. Most of it is not yet colorful. I plan to keep some of it natural color (the alpaca is silver, the BFL is light to medium brown), if I can keep it from leaping into the dyepot on its own. (Tricky stuff, fiber.) There's some colorful sari silk, though. 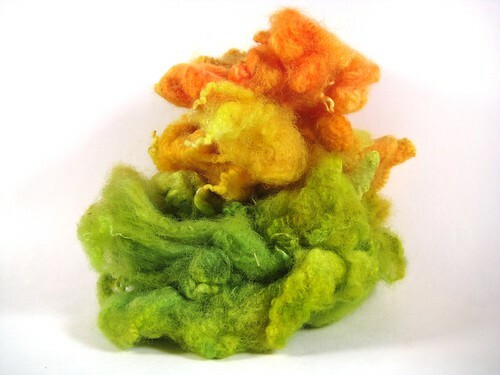 Fancy Tiger has supplies for all sorts of fiber arts: spinning, felting, knitting, crocheting, sewing, and needlework. Highly recommended. They also have a clothing store, which I didn't get a chance to go to. 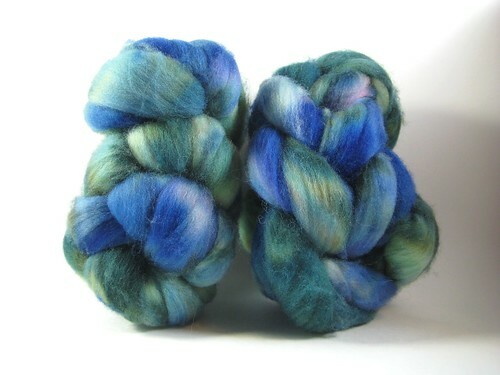 And once I get a little more yarn spun, I'll get some nice pictures of that as well.